We have the majority of sentiment indicators showing more pessimism than in 2008, an explosion in negative news coverage and news that major banks have downgraded their outlooks. Without knowing anything else, you’d expect Gold to be down considerably, yet it’s only off about 5% year to date and 10% in the past three and a half months. Most important, Gold hasn’t even broken support! Gold has failed to break below its 2011 and 2012 lows and that is a telling sign, especially in the face of this pervasive bearish sentiment. Gold looks likely to close at a four week high and we expect it to challenge $1,600 in the coming days. A close below $1,620 would essentially confirm that the bottom is in. Meanwhile, the action in the mining shares has provided enough evidence that at the very least, a tradable low is in. In recent writings we’ve noted the confluence of major support at HUI 336-337. The trendline connecting the 2000 and 2008 lows, the 62% retracement of the 2008 to 2011 cyclical bull and the 50% retracement from the 2000 low to 2011 high all coincided together very close the HUI 336-337. What was the recent low on the HUI? 337. Next we want to turn your attention to the GDX and GDXJ ETFs. Starting with GDX we see the market formed a bullish reversal candle (hammer) last week with huge volume. 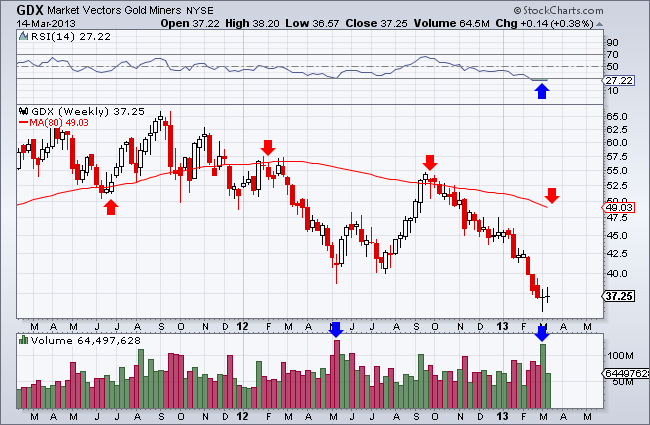 In fact, the only higher weekly volume occurred at the May 2012 bottom when GDX also formed a bullish hammer.